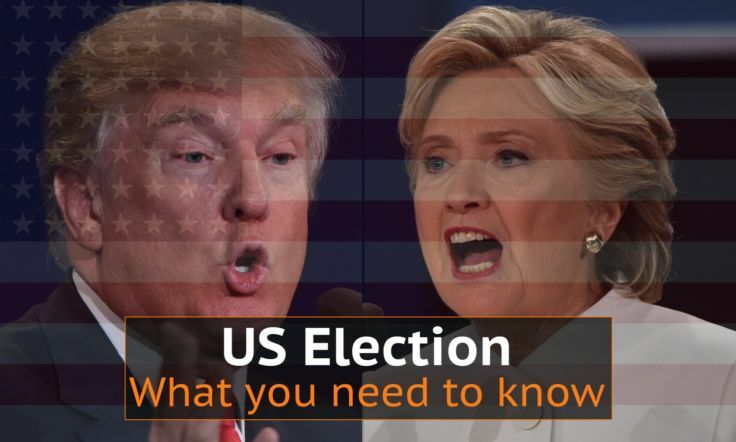 The U.S Presidential election results will be announced On 8 November, where 66.82% of the 218,959,000 have registered to vote. This is much higher than in 2012, where 57.61% of eligible Americans decided to vote. The increased interest in the presidential candidates is unsurprising, but what does it mean for our portfolios? There’s so much buzz around this being a ‘historic’ event that we have to see how the markets are reacting to it. Before we dive headlong into it, I thought it’ll be good to tickle our brains with a little general knowledge. So instead of simply knowing that Trump has a questionable moral compass or that Hillary has a private email account, let’s fill our minds with some cool stuff. WHY IS THE ELECTION HELD ON 8TH NOVEMBER THIS YEAR? Some say that America was an agricultural society and November (the quietest month) was most suited for the rural people. It could have been on Tuesday because people needed time to travel to towns and cities to vote, and some could not have done so in just one or two days. Sounds credible enough to me. Election Day has always been the Tuesday after the first Monday of November. Based on this rule, it could only fall between November 2 to November 8. The last time it was held on November 8 was in 1960, and 1988. 1960 saw one of the closest margins in the election, with a mere 120,000 out of 68 million votes swinging the election in Kennedy’s favor. Sadly, he was assassinated in 1963 in the most high-profile murder of the 20th century. The 1988 elections were more one-sided, with George Bush (Senior) emerging a clear victor. WHAT OUTCOME WILL GENERATE MORE UNCERTAINTY? With Trump being the tough businessman and Clinton being the seasoned politician, the opinion of voters is very much predictable. You won’t even need to be a news analyst to understand how the general public views them. 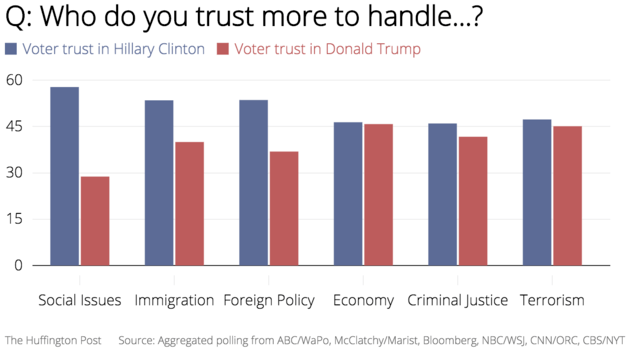 In the image below, it seems that Hillary has garnered more support in terms of her ability to handle the pressures of the Presidential office. 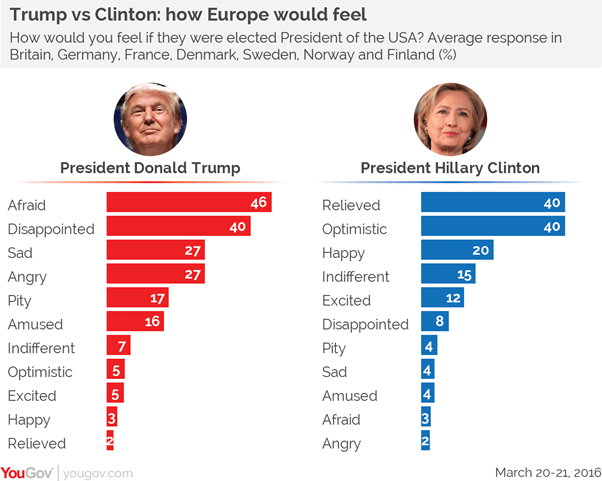 In Europe, it seems that the consensus is that Trump would reap economic havoc, while Hillary would bring great relief. I can just imagine the great fear and trembling that people would feel if Donald Trump were the commander-in-chief, holding the codes for nuclear warheads being released around the world. Well, that depends on which markets you are looking at. From a purely fundamental point of view, the market hates uncertainty and it seems logical to believe that markets will rise (by default) if Hillary was president. It agrees with the opinion that Hillary is unlikely to bring a lot of change to the White House, and that things will just continue chugging along. I stumbled upon an article where an analyst seemingly guarantees that Gold would rise. 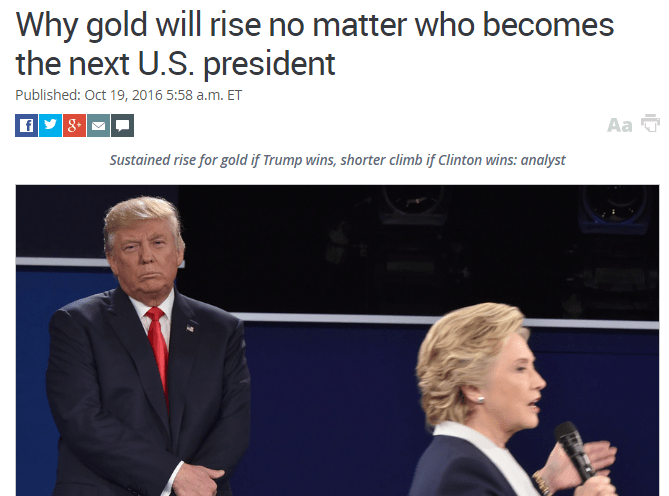 Although I am bullish on Gold (in the long run) as well, I think that this election is not the key driver. As a trader, I always operate in a fog; one moment the market could be bullish, and the next moment the entire sentiment gets reversed. Of course, one can be of the view that Hillary will bring great relief to America and the rest of the world, but what would you do to your portfolio if markets behave otherwise? A cursory glance at the S&P 500 and Gold chart might lead you to conclude otherwise. In the short-term, Gold is not necessarily a safe haven, and it does not have a clear inverse relationship with the S&P 500 in recent years. In both charts above, we see that both seem to be topping out, and the S&P has even broken out of a recent wedge pattern. Gold is struggling to recover from a large breakout from its own wedge pattern as well. Among the many doomsayers out there, I do think there will be a reaction to the market but financial mayhem is quite a stretch. These people’s comments range from something as mild as “a sharp correction”, to “total financial destitution”. At the start of Obama’s term in 2008, he inherited a 34% dip in the Dow Jones Index upon being elected the President. How much attribution will a “bad” president actually have on financial destruction? The crash of 2008 was the result of systemic banking failure. The crash of the Chinese stock market index in June 2015 was the result of an unprecedented increase in the number of stock pundits (customer brokerage account openings actually double and tripled in the years preceding the crash). Using statistics of presidential elections since 1945, when the U.S stock market (S&P500) was increasing quickly, the incumbent candidate (Hillary) won 82% of the time; now that’s some pretty decent odds. But when the stock market was falling, the challenger (Trump) won in every election since 1984. While the S&P500 has been steadily rising since 2009, it is starting to look a bit toppish and had a slight correction in the last 1-2 months. With Europe teetering on the edge of a recession, Trump’s policies could cause Europe to fall into a full-blown economic depression. That’s a real possibility. With his protectionist stance and nationalistic agenda, Trump could very well be the untimely catalyst. There seems to be a consensus that volatility in markets will increase leading up to the election (before the mayhem happens, on the actual day, and also in the weeks to come). This makes the Pound interest rate announcement (on Thursday 8pm), and the Non-Farm Payroll announcement (Friday 8:30pm) pale in comparison. My take is that the election has generated far greater anticipation in the financial markets, and these two news events would be a tremor compared to the earthquake that might come. In the chart above, the VIX has risen steadily for the past week.This is the first time we’ve seen a steady increase in volatility over 7 days; a steady increase like this has not happened for the whole of this year. With Trump’s tough stance on immigration and trade, his intention to renegotiate the North-American Free Trade Agreement (NAFTA) and scrap the Trans-Pacific Partnership (TPP), the mere mention of such a stance would likely send jitters into emerging markets. Of course, there are those of the camp that America couldn’t care less about a president, because the world is in a state of low-growth and inflation. Experts have said this is a global Japan-style stagflation and that these conditions mirror those in the 1970s. 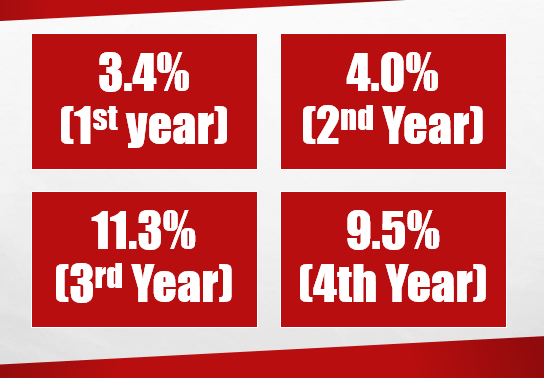 HOW DID THE MARKETS FARE IN PREVIOUS ELECTIONS? A Princeton Research Paper found that GDP growth under a Democrat President (Hillary is a Democrat Candidate) is 1.80% higher, on average, than a Republican President (Trump is a Republican Candidate). This suggests that a Hillary win would be more bullish for markets. In the most recent FOMC meeting (3rd November 2am SG time), the interest rate remained unchanged, which was expected since they are unlikely to want to rock the markets further just prior to the elections. The next major piece of news is the NFP on Friday, and for traders who have decided to hold any major medium/long-term positions over the election, this could be a good opportunity to take positions at better prices. This is because the NFP is likely to cause price spikes, but markets are likely to stabilise and flat out rather than trend strongly before the US elections next week. Based on my personal views (this is not any recommendation to follow), I would prefer to take a bearish position (short) on the S&P 500 going into the election, as I feel that there is more downside potential in general, and the market is more “priced in” for a Hillary win, meaning a Trump win would have more spectacular returns. My plan is to make use of the NFP to enter my positions, for example if the NFP causes an intraday bullish spike in prices, I will use the opportunity to accumulate shorts at more favourable prices. This will enable me to reduce my risk and increase my upside. Forex Trading | $1k Quick Profit for FOMC!